I always marvel at the horrific and terrifying scenarios in fiction films and books that the victim characters fail to escape from given the opportunity. I would kick the evil and malicious housekeeper out in the sub-zero temperatures to fend for herself, as she pretty much causes the majority of the trouble in this book. In real life people simply don’t act in the same way; most are motivated by selfish reasons, and this includes protecting their family regardless of who else might be hurt. Although natural, if the protagonists moved in the manner I have suggested, we simply wouldn’t have a story. So, although somewhat ridiculous at times, we accept this poetic licence in order to experience the suspense, tension and chills of a slowly boiling claustrophobic psychological horror. This is certainly a slow boiler. But it works. Fir is the seventh title in the new Red Eye series of individual supernatural horror novels, an imprint of Stripes Publishing which is targeted at a teenage readership. The back of the book warns: Not for Younger Readers – and that’s certainly the case. However, in no way does this book talk down to its audience, and I venture as far as to say you can treat this as an adult read too, because it refuses to hold back from very vivid imagery for the imagination. The ancient fir trees appearing to press closer to the house, the sabotage and accidents, the back history of the plantation house, the sightings of a mysterious boy: all of this set against a Scandinavian legend. The fact that the heavy snows come early creates a sort of base-under-siege backdrop, which might prevent the Stromberg family from leaving if not for their earlier missed opportunities. Telling the tale in the first person, from the point of view of a teenage (but not necessarily immature) girl, works quite well, and is a refreshing alternative from the normal adult perspective. 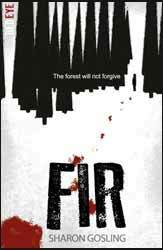 I read Fir from cover to cover and found it quite enjoyable. As with many horror tales the ending is a slight let down, after such a controlled build-up, but I’m glad to say it didn’t ruin what had gone before. I think this effect is systematic with horror.